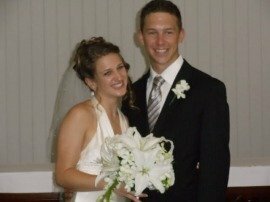 I am the owner of 'Tropical Weddings Australia' and 'Palm Cove Weddings' and I thought I would share this lovely story with you. One evening last year around 10.30pm the telephone rang. As it was rather late I hesitated a little but am always available as many of our clients are from overseas and in a different time zone. An American voice told me that he and his fiancée wanted to come to North Queensland to get married whilst on leave from the US Army. They were both serving in Afghanistan! The wedding was to be just over a month away and all communication had to be shrouded in secrecy. With very little to go on, we emailed their forms, arranged their Priest and Catholic Church and waited for their arrival. We learnt that just 2 weeks before their hoped for leave date (they never know if they have to be recalled) Tom was blown up in his truck in an ambush. Fortunately, he was not seriously hurt and after a short spell in hospital was allowed to leave - a few days after his original planned date. We met them at the airport and waited with them for the arrival of Nicole's Sister and Tom's brother straight from the USA. As you can imagine it was an emotional reunion. 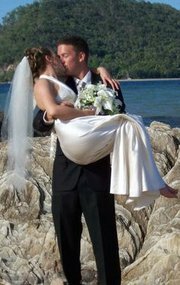 The next day we took them into Cairns to find a wedding dress and suit etc, as they had nothing to wear. (No shops where they came from)! Their wedding went without a hitch and their happiness was incalculable. We felt very privileged to be asked to the Ceremony. During the next few days they did everything that North Queensland has to offer and loved and enjoyed every special moment together. When we took them back to the airport we were sad to see them go and wondered what awaited them back in the war zone. They have kept in touch and were thankfully kept safe and have now finished their term out there. Last week we received the wonderful news that they are now the proud parents of Alison and are all back in the arms of their families in Florida. We couldn't be more thrilled at this happy ending and new beginning. Lovely stories, Francetta and Ted. Thank you very much for sharing! I was a concert performer and sang this at Chicago Orchestra Hall. And a few private weddings afterward. But 12 years ago, my new wife requested I sing this to her at our wedding. Keep these words, they are so fitting of your lives so far. OR: hear John Denver sing it with Placedo Domingo. Click here to return to Tropical Weddings.